The 26th annual Marine Aquarium Conference of North America will take place in Denver, Colorado, August 29 to 31. Image detail from MACNA XXVII Program Book. 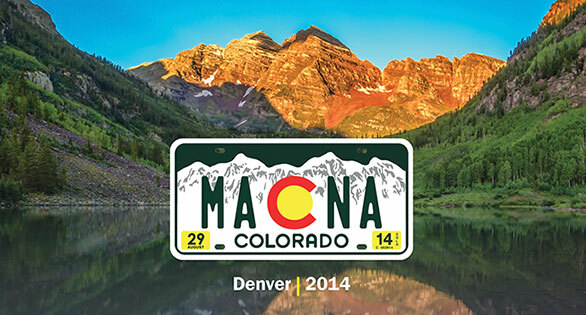 The world’s leading annual gathering of saltwater aquarists, the Marine Aquarium Conference of North America, now in its 26th year, will take place in Denver, Colorado, August 29-31, 2014. Reservations for advertising sponsorships in the MACNA Conference Program Book are now being accepted. Designated as the official publishers of the Program Book, Reef to Rainforest Media in Shelburne, Vermont will be coordinating advertising sales as well as the creation of the guide, to be published in print and—for the first time—digital editions. Reef to Rainforest Media is also the publisher of CORAL, The Reef & Marine Aquarium Magazine. MACNA Media Kit. Click to enlarge. 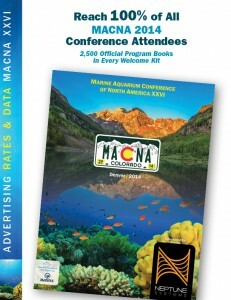 “We are honored to have been invited to publish the MACNA Program Book,” says Editor & Publisher James Lawrence. “I’ve personally attended virtually every MACNA, and these books are true collector’s items. Looking back through past programs, one can trace the evolution and growth of the marine aquarium hobby.” Lawrence says the Program Book will be a collaborative effort with Jake Adams and Rob Mougey of the host organization, and using the resources of CORAL Magazine’s publishing team and printer. Event organizers report that a record turnout of aquarium industry exhibitors are expected at the Mile High Colorado Convention Center. “As the first MACNA to be held in the West since MACNA X in Los Angeles, we are expecting to pull from a large pentup base of established and new aquarists. The last time a MACNA was held in the West, the reef tank explosion hadn’t hit yet,” says Mougey a member of the organizing group, Colorado Organization for Reef & Aquatic Life. BOOTH RESERVATIONS are still available: Click for Exhibitor Info.